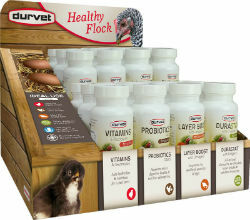 Antibiotic free poultry soluble powders help keep your flock naturally healthy! Vitamins & Electrolytes, 100 gm jar - Aids in hydration & nutrition for a fast start. Probiotics Daily, 100 gm jar - Supports avian digestive health and nutrients absorption. Layer Boost, 100 gm jar - Improves the quality & quantity of eggs. DuraStat, 100 gm jar - All-natural alternative to stimulate water intake & enhance immunity. All powders may be used together at the same time.